Lion fight which has become one of the leading promoters in the United States will put on another world class event in fight capital Las Vegas. Promoter Scott Kent has done it again, with some of the best muaythai athletes from around the world. 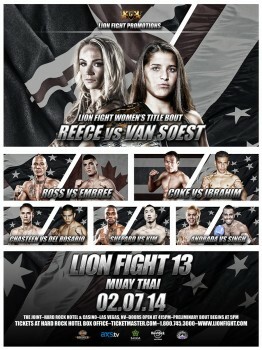 The fight card will be headed by a female title fight with Caley Reece vs Tiffany Van Soest. Both ladies need no introduction. Caley Reece is a multiple World Champion, winning the IFMA world championship, WMC world title, Silver Medallist at the World Combat Games, and won the Prime Minister’s trophy supported by the Thailand Prime Minister on the launch of muaythai towards International Olympic committee. Tiffany Van Soest has been unbeaten and stopping the UK champion Lucy Payne in sensational style in the first round. This fight will be a fantastic promotion for female muaythai. Further on the card is LA based and former WMC champion Kevin Ross vs Matt Embree. In the rematch against Matt Embree, Kevin Ross is trying to set the record straight. There are many more fights on the card…..